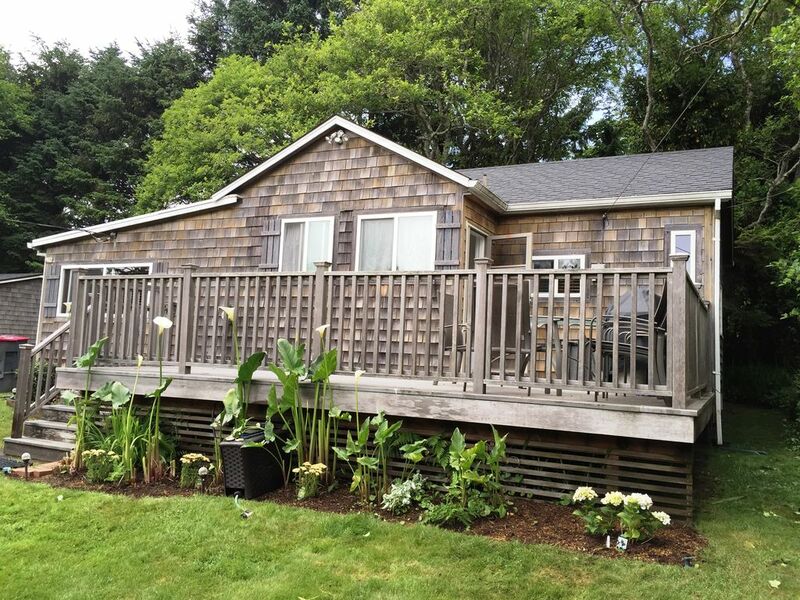 This charming 800 square foot cottage is located just a block from the beach and only one short block from downtown Cannon Beach on the West side of Hemlock Street. This cottage has two bedrooms. One bedroom has a queen-size bed. The second bedroom has two twin beds. There is a large queen size sleeper couch in the living room. The cottage sleeps six people comfortably. There is a full size kitchen with a dishwasher and microwave. The kitchen is completely furnished with all the basics for cooking. Both the livingroom and master bedroom have TV/Blue Ray Players and are hooked up to digital cable. The second bedroom has a TV/Blue Ray Player. A large deck surrounds the front of the cottage. You can hear the ocean roar while sunning on this deck. From the cottage, you're a few minutes walk to the beach and about a mile from Haystack Rock. At night, walk down to the beach and make a fire! This quiet cabin is located in a quiet residential neigborhood just steps from downtown. I am a licensed social worker and retired Army Colonel. My wife is a Financial Advisor. We live in the Seattle area and frequent Cannon Beach. We both have traveled extensively throughout the US and the World. Our property is a cozy cottage that is right downtown in Cannon Beach. Walk a block to the beach or walk a block to downtown or walk 4 blocks to mid-town--- your choice! Our property is not the party destination yet it is a more than fun and comfortable setting and getaway for couples, small families and a small group of friends. That's what we use our cottage for and we hope you find it as fun and relaxing! Let me tell you what's new in 2018 for the cottage! This year we have repainted the complete interior. We plan on installing a new hood over the stove for better venting. We have purchased new linens for the beds. All of the appliances recently replaced are working great. We have a roomy bathroom with a deep tub for a cozy cabin. The cottage is located in the 'downtown area' of Cannon Beach on the West side of Hemlock. We are not in the mid-town or Tolivana areas. We are 1 block from the Ocean. You do need to walk to the end of the street. Not a view from the cottage. Wall and fireplace electric in the living room. Baseboard heat in the bedrooms. Must be washed and replaced prior to departure. Leather sofa and Love seat, coffee table and wide screen TV and BluRay. New in 2015! Full Size with Freezer. Basic cookware is at the cottage. Dining area directly adjacent to the kitchen behind the living area. Digital In living room and master bedroom. Stereo is available using the wide screen tvs both by external source and by cable music channels. Blue Ray in living room and in both bedrooms. We have some books to share. Limited beach toys for the little ones. Bring your own game box and use them with our wide screens. We have a large front deck and a small back deck. The front deck has a table and chairs for six. Perfect location and just what we needed for a family spring break. liked wandering the town and spending hours at the beach. Everything we needed was there. No need to drive anywhere. Beach is close. Transaction was easy and uncomplicated. Thanks Dwight! Lovely Home Close to the Beach! We had a wonderful stay at this cottage. It was a VERY quick 5 min or less walk to the beach (close enough to run our 5 year-old back to the bathroom), and central to the main downtown road. The rooms were spacious, and we found everything we needed in the kitchen. House was fantastic. The people there before us didn't do a good job cleaning up even though the owner left plenty of supplies and instructions. That was our only complaint. Otherwise amazing location. Perfect for a small family and great location! This cottage was perfect for my small family's weekend away. It was well stocked with everything you need. We also never had to used our car while we were here since it was located so close to town and the beach. Cleaning up ourselves before we left was a great trade off to the money you save by not paying a cleaner. The only issue I can think of is that the ants that are easily attracted to any left over crumbs, meaning you'll need to keep your food sealed and dishes cleaned. We hope to stay here again! Cannon Beach is one of the most popular beach destinations on the West Coast and is often rated in the top 10 by Sunset Magizine. It is only a 1 1/2 hour drive from Portland and just 4 hours from Seattle. Many people believe that Cannon Beach has one of the best ocean beaches and oceanfront communities in Oregon and the West Coast. Haystack Rock, a giant monolith, is located just a short walk away. This rock draws thousands of tourists as it is home to starfish, sea urchins, sea birds, and many other sea life of the Oregon Coast. The City of Cannon Beach is known for its art shops, local live theater and friendly atmosphere. Stroll down the main street and you will find many clothing and specialty shops. Excellent restaurants are just a stroll away featuring a full variety of foods from informal hamburger and pizza places to fine Northwest cuisine dining. cineplex, and many shops and restaurants. The kids will enjoy the arcade and bumper cars located in heart of downtown Seaside. Mom and dad will enjoy the antique and specialty shops which are throughout the city. No unauthorized pets of any kind including pets of your friends are allowed in the Cottage. Guests must clean the cottage upon departure. Cleaning includes washing and drying of all linens and making the beds. It includes washing of all dishes and putting them away. I suggest that on the day of departure that you wash your bed sheets when you get up as this process is what takes the longest to complete. A cleaning checklist and supplies are provided. Check out time is 12 Noon. Check in time is 3 PM. There is a damage deposit of $100 required. It is fully refundable as long as the property is left clean and undamaged. Damage that is charged would be that over and above what minor issues that could be expected. For instance, a broken dish or glass could be expected. A gash or hole in a door is not expected. If there is a problem please just call me and we will work out any issues. It is expected that you will leave the cottage as clean as you found it. If you find it not to your standards.... please call me immediately and I will deal with it immediately. Please email me your home address for my records as required by the city. No refunds for cancellations within 30 days for all dates. 50% refund for cancellations within 60 days. Damage Deposits are normally refunded within two weeks of departure. You must use the Homeaway payment system . As you can see from my listing we have been doing this for over 15 years and I believe you will find my system will work for you.